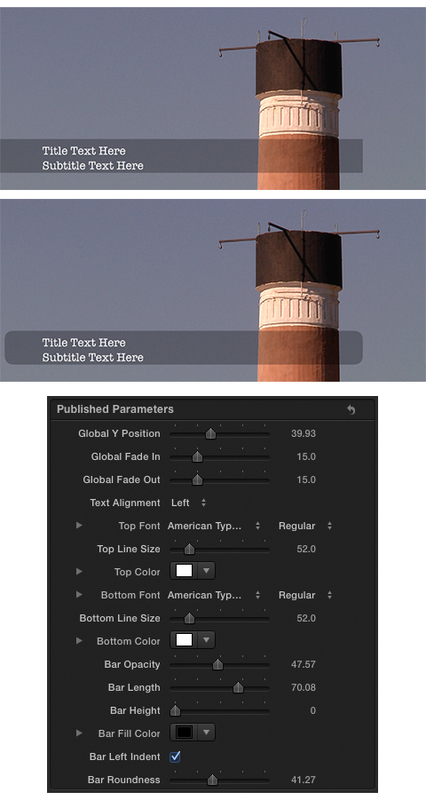 I am releasing an alternative version of my Information Bar Fill Custom Lower Third Title for FCPX. This version is designed to be used over clips with a 2.35:1 aspect ratio. Basically I’ve tweaked the default values for the initial positioning of the two lines of text as well as the graphical bar. I’ve also reset the low value limit for the horizontal positioning of the text and bar that will prevent these elements from moving outside of the image frame. One of the great features of Final Cut Pro X is the availability of Apple’s 64bit Logic audio processing plugins (aka Filters). 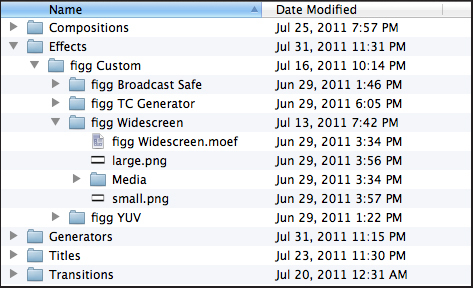 In fact FCPX supports all 64bit Audio Units developed by third parties. Let me first point out I’ve tested a fair amount of 64bit Audio Units in FCPX. Results have been mixed. Some work flawlessly. A few result in sluggish performance. Others totally crash the application. 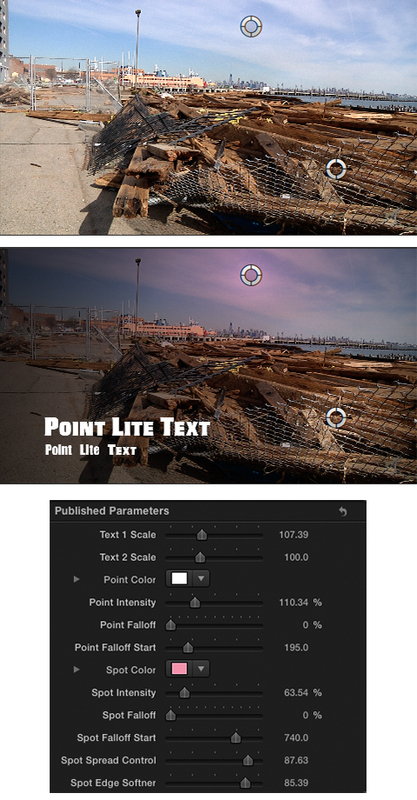 I can report that Nugen’s ISL True-Peak Limiter and Wave Arts Final Plug work very well in the FCPX environment. ISL is a Broadcast Compliant True-Peak Limiter that uses standardized ITU-R B.S 1770 algorithms. Settings include Input Gain and True-Peak Limit. ISL fully supports Inter-Sample Peak detection. Final Plug allows the operator to set a limiting Threshold as well as a Peak Ceiling. Decreasing the Threshold will result in an increase of average loudness without the audio output ever exceeding the Ceiling. Recently Flux released a 64bit version of Elixir, their ITU/EBU compliant True-Peak Peak Limiter. Currently (at least on my MacPro) the plugin is not usable. Applying Elixir to a clip located in the FCPX storyline causes an immediate crash. I’ve reported this to the developer and have yet to hear back from them. The plugins noted above range in price from $149 to $249. One recommendation that often appears on discussion forums and blogs is the use of the Logic AU Peak Limiter to boost audio loudness while maintaining brick-wall limiting. This process is especially important when a distribution outlet or broadcast facility defines a specific submission target. A few audio pro’s have taken this a step further and recommended the use of the Logic Compressor instead of the Peak Limiter. In my view both are good. However proper setup can be daunting, especially for the novice user. These days picture editors need to know how to color correct, create effects, and handle various aspects of audio processing. If you are looking for a straight forward audio tool that will brick-wall limit and (if necessary) maximize loudness, I think I found a viable solution. 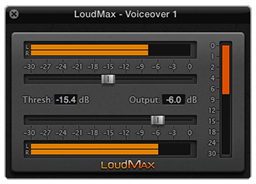 LoudMax is an easy to use Peak Limiter and Loudness Maximizer. Operators can use this plugin to drive audio levels and to set a brick-wall Output Ceiling. The LoudMax Output Slider sets the output Ceiling. So if you are operating in the “just to be safe mode”, or if you need to limit output based on a target spec., set this accordingly. If you need to increase the average loudness of a clip – decrease the Threshold setting until you reach the desired level. The Output Ceiling will remain intact. LoudMax also includes a useful Gain Reduction Meter. If viewing this meter is not important to you – there’s no need to run the plugin GUI. 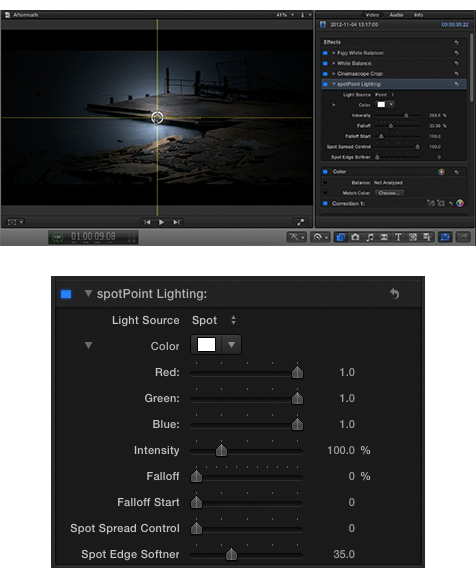 The Threshold and Output parameters are available as sliders, much the same as any other FCPX Filter or Template. You can also set parameter Keyframes and save slider settings as Presets. Using the Logic Peak Limiter and/or Compressor is definitely a viable option. Keep in mind that achieving acceptable results takes practice. Proper usage does require a bit more ingenuity due to the complexity of the settings. I’ll be addressing the concepts of audio dynamics Compression in the future. For now I urge you to take a look at LoudMax. It’s 32/64bit and available in both VST and AU formats. The AU Version works fine in FCPX. I found the processed audio results to be perfectly acceptable. At the time of this writing LoudMax is available as Freeware. Below I used the Spot Light to warm up the sky independent of the Point Light. 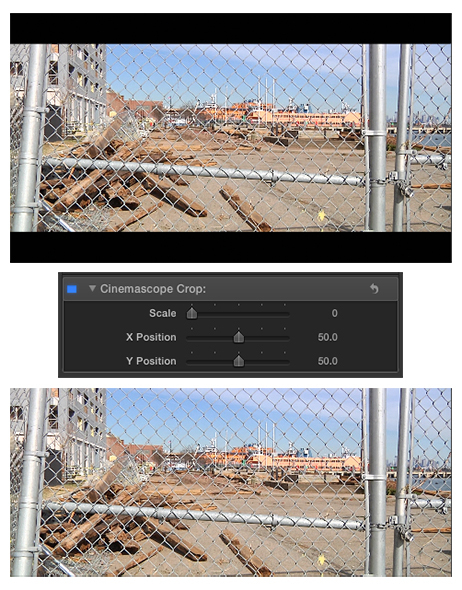 Cinemascope Toolkit ver.1.2 has been released. 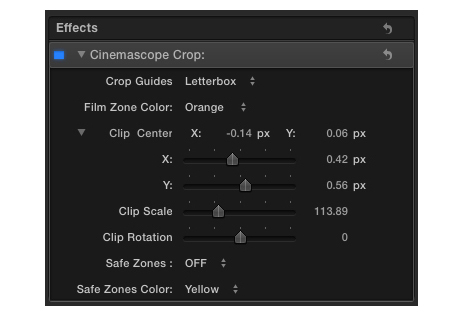 The Crop Guides popup now displays one of three options:Letterbox, Film Zone, Letterbox and Film Zone. The Film Zone is essentially a set of colored cropping guides less the letterbox matte(s). Viewing the underlying clip with the Film Zone displayed on it’s own makes it easy to view what is being cropped. Also, the Film Zone display works well when the underlying clip is very dark at the top and/or bottom of the frame. You can set the Film Zone color to orange (default), black, or white. Also new in this release is the capability to reposition the clip manually by clicking and dragging the center point object (Drag Target). 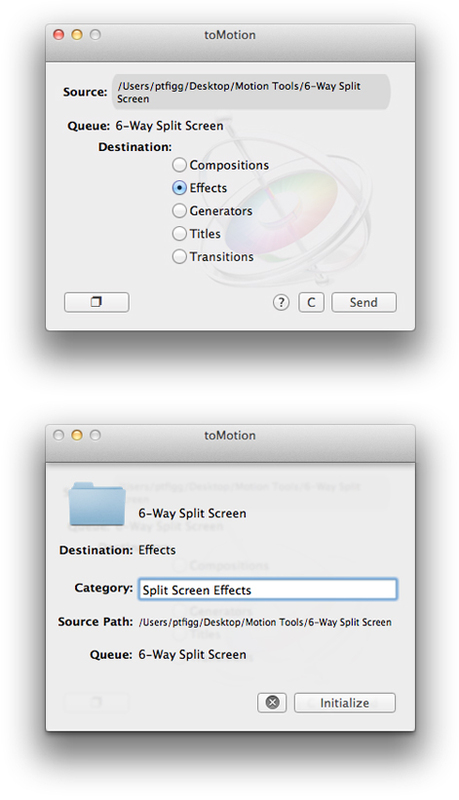 When doing so the clip positioning sliders in the EFX UI will update accordingly. In the image matrix below you can see the top clip was repositioned (and scaled). 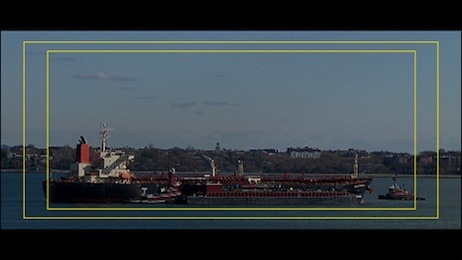 The visible Film Zone clearly displays the 2.35:1 frame. 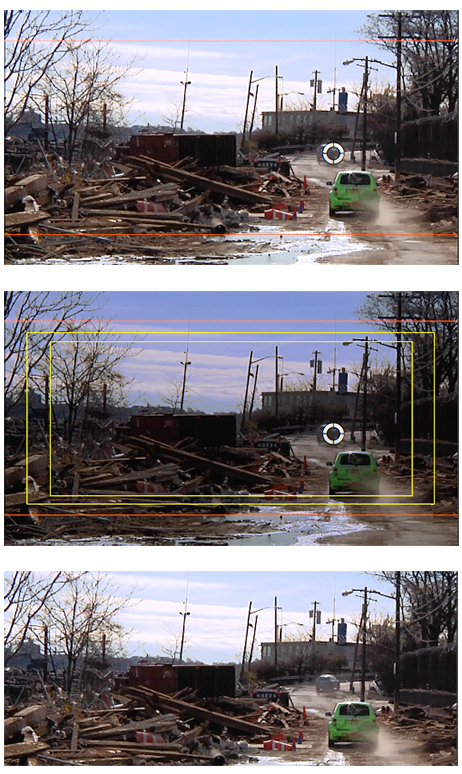 In the middle image the 2.35:1 Safe Zones are displayed along with the Film Zone. Note the clips reduced opacity. The bottom image is the cropped output. 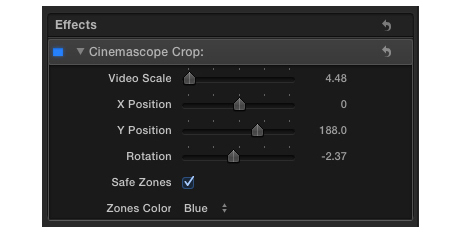 Please note you must set the FCP X Player Background to Black when using Cinemascope Toolkit. Do this in the application Preferences/Playback. When you switch on the Safe Zones display the clip opacity is reduced. This provides a clear view of the zones. If the player background is set to Checkerboard, there’s nothing behind the clip – it’s transparent. The clip’s opacity reduction will be prevelant and this feature will be useless. Also – I designed the matting system to be independent of the clip’s image layer. Any agressive grading or exposure adjustments will have no effect on the visual state of the letterbox matte(s). 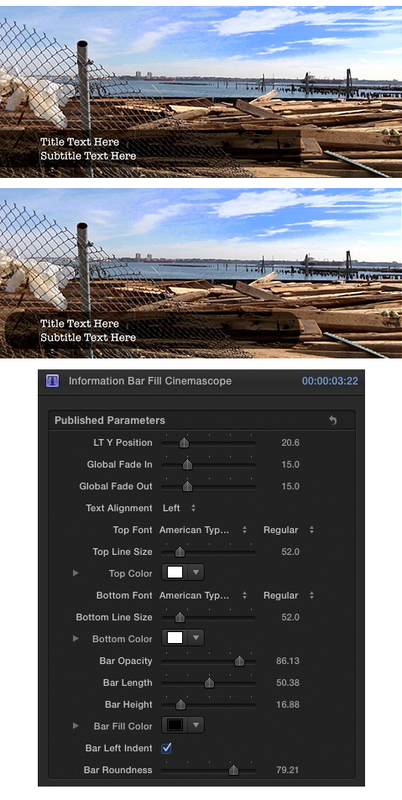 Cinemascope Toolkit ver.1.1 was released yesterday. I added the ability to display 2.35:1 Safe Zones (Yellow or Blue) to clip(s) where the filter is applied. When the Safe Zones option is switched on the underlying clips’ opacity is reduced to about 30%. Below I use the Yellow Safe Zones for better visibility. The Rotation parameter is also new. Instead of publishing the default Motion circular knob object to control this effect I used a slider. 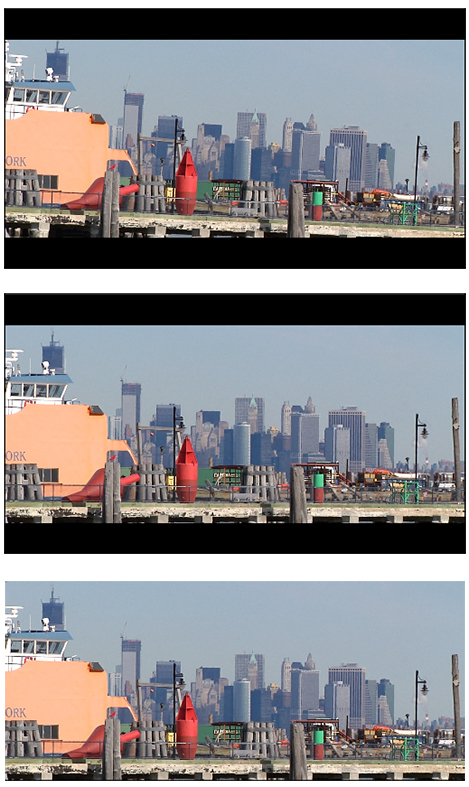 Moving it in either direction rotates the video image CW/CCW up to +/- 20°. Keep in mind you may need to adjust the scale of the image to compensate for the rotation of the frame. It all depends on how you decide to frame your image within the letterbox matte(s). I needed to export a still of the shot below @2.35:1. Notice in the top example the image framing is off. Pulling the Rotation slider slightly to the left fixed the problem. The exported (cropped) image looks much better.